Size: model – 11 3/4" (29.9 cm) long, case at the base -15"(38cm) long. 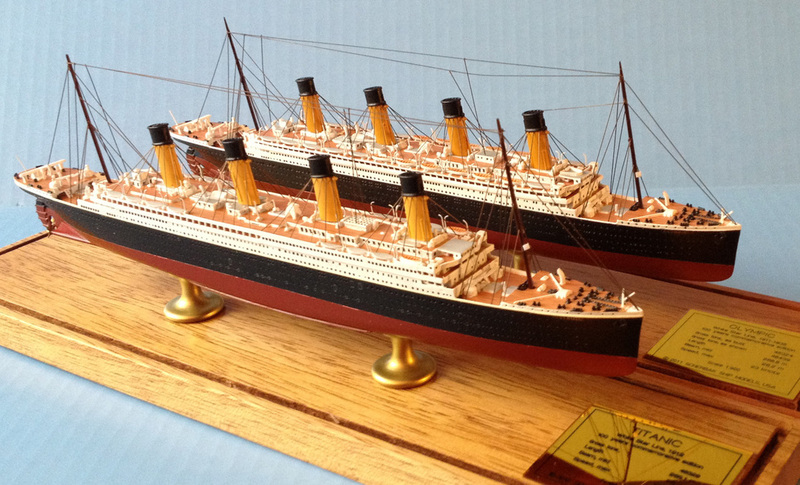 Model Description: Beautiful Display Series full hull ocean liner ship models in scale 1:900. Our models of Olympic and Titanic are thoroughly researched and expertly designed to exact hull lines, architectural proportions and details. Models show the difference between both famous ships. Also Olympic modeled as she appeared after her post WW1 refit. Made of heavy cold cast resin, hand assembled, hand painted. Details include recessed windows and portholes, life boats, deck gear, etc. Comes in display case with wooden base on protective pads, brass mountings, name/data plaque and high grade acrylic clear cover. SCHERBAK ship models are best gifts for many occasions including Birthday and Christmas. RMS Olympic was the lead ship of the Olympic-class ocean liners built for the White Star Line which also included Titanic and Britannic. Unlike her sisters, Olympic served a long and illustrious career (1911 to 1935), including service as a troopship during World War I, earning the nickname "Old Reliable." For a short time she was the largest ocean liner in the world. Olympic-class ships were intended to surpass Cunard’s largest ships, Lusitania and Mauretania in size and luxury. Construction of the Olympic began three months before Titanic to ease pressures on the shipyard. Several years would pass before Gigantic (renamed Britannic after Titanic's sinking) was constructed with post-Titanic modifications. In order to accommodate the construction of the class, Harland and Wolff upgraded their facility in Belfast; the most dramatic change was the combining of three slipways into two larger ones. Olympic's keel was laid in December 1908 and she was launched on 20 October 1910. For her launch, the hull was painted in a light grey colour for photographic purposes (a common practice of the day for the first ship in a new class, as it made the lines of the ship clearer in the black and white photographs). Her hull was repainted following the launch. Her maiden voyage commenced on 14 June 1911. Designer Thomas Andrews was present for the passage to New York and return, along with a number of engineers, as part of Harland and Wolff's "Guarantee Group" to spot areas for improvement. Olympic had a cleaner, sleeker look than other ships of the day: rather than fitting her with bulky exterior air vents, Harland and Wolff used smaller air vents with electric fans, with a "dummy" fourth funnel used for additional ventilation. For the powerplant Harland and Wolff employed a combination of reciprocating engines with a centre low-pressure turbine, as opposed to the steam turbines used on Cunard's Lusitania and Mauretania. White Star claimed the Olympic class's engine set-up to be more economical than expansion engines or turbines alone. Olympic consumed 650 tons of coal per twenty four hours with an average speed of 21.7 knots on her maiden voyage, compared to 1000 tons of coal per twenty four hours for both the Lusitania and Mauretania. Olympic's first major mishap occurred on 20 September 1911, when she collided with HMS Hawke off the Isle of Wight. Although the incident resulted in the flooding of two of her compartments and a twisted propeller shaft, Olympic was able to return to Southampton under her own power. Royal Navy blamed Olympic for the incident, alleging that her large displacement generated a suction that pulled Hawke into her side. In command during this incident was Captain Edward Smith, who was lost at sea a year later onboard Titanic. One crew member, Violet Jessop, survived not only the collision with the Hawke but also the later sinking of Titanic and the 1916 sinking of Britannic the third ship of the class. The Hawke incident was a financial disaster for Olympic's operator, and keeping her out of revenue service made matters worse. Olympic returned to Belfast, and to speed up her repair, Harland and Wolff was forced to delay Titanic's completion in order to use her propeller shaft for Olympic. In February 1912, Olympic lost a propeller blade, and once again returned to her builder for repairs. To get her back to service as soon as possible, Harland & Wolff again had to pull resources from Titanic, delaying her maiden voyage from 20 March 1912 to 10 April 1912. Fear absolutely no hope searching Titanic's position. Left Leyland S. S. Californian searching around. All boats accounted for. About 675 souls saved, crew and passengers, latter nearly all women and children. Titanic foundered about 2.20 a. m., 5.47. GMT in 41.16 north. 50.14 west; not certain of having got through. Please forward to White Star - also to Cunard. Liverpool and New York - that I am returning to New York. Consider this most advisable for many considerations. Olympic, like Titanic, did not carry enough lifeboats for everyone on board, and was hurriedly equipped with additional, second-hand collapsible lifeboats following her return to England. Towards the end of April 1912, as she was about to sail from Southampton to New York, the ship's firemen went on strike because of fears that the ship's new collapsible lifeboats were not seaworthy. The 40 collapsible lifeboats were secondhand, having been transferred from troopships, and many were rotten and could not open. The men instead sent a request to the Southampton manager of the White Star Line that the collapsible boats be replaced by wooden lifeboats; the manager replied that this was impossible and that the collapsible boats had been passed as seaworthy by a Board of Trade inspector. The men were not satisfied and ceased work. On 25 April a deputation of strikers witnessed a test of four of the collapsible boats. Only one was unseaworthy and they said that they were prepared to recommend the men return to work if it was replaced. These terms were accepted. However, the deputation said that they would not sail aboard the Olympic unless the strikebreakers were removed, a condition which the company refused to accept, saying that they would rather abandon the sailing than dismiss loyal men. All 54 strikers were arrested on a charge of mutiny when they went ashore. However, on 4 May 1912 Portsmouth magistrates found the charges against the mutineers were proven, but discharged them without imprisonment or fine due to the circumstances of the case. Most of the strikers returned to work and the Olympic sailed on 15 May. On 9 October 1912 White Star withdrew Olympic from service and returned her to her builders at Belfast to be refitted to incorporate lessons learned from the Titanic disaster. A complement of 64 wooden lifeboats were installed along the boat deck, stacked two high. In addition, an inner watertight skin was constructed in the boiler and engine rooms and some of the watertight bulkheads were extended up to B-deck. At the same time, alterations and additions to her passenger cabins were carried out on B Deck which necessitated deleting her B Deck promenades - one of the few features that separated her from her sister ship. With these changes, Olympic's gross tonnage rose to 46,359 tons, 31 tons larger than Titanic's. In 1913, Olympic returned to service and briefly regained the title of largest ocean liner in the world, until SS Imperator entered passenger service in June 1913. In World War I, Olympic initially remained in commercial service under Captain Herbert James Haddock. She sailed from New York on 20 October 1914 for Britain, though carrying very few passengers, as Germany had announced that her U-boats would sink the Olympic on sight and most of the passengers had cancelled. On the sixth day of her voyage, the Royal Navy alerted Haddock that four U-boats were pursuing his ship and ordered him to head north for Glasgow instead of continuing into the English Channel. On 27 October, as the Olympic passed near Lough Swilly, she received distress signals from the battleship HMS Audacious, which had struck a mine off Tory Island and was taking on water. The Olympic took off 250 of the Audacious' crew, then the destroyer HMS Fury managed to attach a tow cable between Audacious and Olympic and they headed west for Lough Swilly. However, the cable parted after the Audacious' steering gear failed. A second attempt was made to tow the warship, but the cable became tangled in HMS Liverpool’s propellers and was severed, and a third attempt also failed when the cable gave way. By 17:00 the Audacious' quarterdeck was awash and it was decided to evacuate the remaining crew members to Olympic and Liverpool, and at 20:55 there was an explosion aboard the Audacious and she sank. Admiral Sir John Jellicoe, Commander of the Home Fleet, was anxious to suppress the news of the sinking of Audacious, for fear of the demoralizing effect it could have on the British public, so ordered Olympic to be held in custody at Lough Swilly. No communications were permitted and passengers were not allowed to leave the ship. The only people departing her were the crew of the Audacious and Chief Surgeon John Beaumont, who was transferring to RMS Celtic. Steel tycoon Cahrles M. Schwab, who was travelling aboard the liner, sent word to Jellicoe that he had urgent business in London with the Admiralty, and Jellicoe agreed to release Schwab if he remained silent about the fate of Audacious. Finally, on 2 November, Olympic was allowed to go to Belfast where the passengers disembarked. Following Olympic's return to Britain, the White Star Line intended to lay her up in Belfast until the war was over, but in September 1915 she was requisitioned by the Admiralty to be used as a fast troop transport. Stripped of her peacetime fittings, and armed with 12-pounders and 4.7-inch guns, the newly-designated HMT (His Majesty's Transport) 2810 left Liverpool on 24 September 1915, carrying soldiers to Mudros, Greece for the Gallipoli campaign. On 1 October she sighted lifeboats from the French ship Provincia which had been sunk by a U-boat that morning off Cape Matapan and picked up 34 survivors. From 1916 to 1917, Olympic was chartered by the Canadian Government to transport troops from Halifax, Nova Scotia, to Britain. In 1917 she gained 6-inch guns and was painted with a “dazzle”camouflage scheme to make it more difficult for observers to estimate her speed and heading. After the United States declared war on Germany in 1917, Olympic transported thousands of U.S. troops to Britain. In the early hours of 12 May 1918, while en route for France with US troops under the command of Captain Bertram Fox Hayes, Olympic sighted a surfaced U-boat 500 m (1,600 ft) ahead. Her gunners opened fire at once, and she turned to ram the submarine, which immediately crash dived to 30 m (98 ft) and turned to a parallel course. Almost immediately afterwards Olympic struck the submarine just aft of her conning tower and her port propeller sliced through U-103’s pressure hull. The crew of U-103 blew her ballast tanks, scuttled and abandoned the submarine. This is the only known incident in World War I in which a merchant vessel sank an enemy warship. Olympic returned to Southampton with at least two hull plates dented and her prow twisted to one side, but not breached. Olympic did not stop to pick up survivors, but continued on to Cherbourg. The USS Davis sighted a distress flare and picked up 31 survivors from U-103. It was discovered that U-103 had been preparing to torpedo the Olympic when she was sighted, but the crew could not flood the two stern torpedo tubes. During the war, Olympic is reported to have carried up to 201,000 troops and other personnel, burning 347,000 tons of coal and travelling about 184,000 miles. Her impressive World War I service earned her the nickname Old Reliable. In August 1919 Olympic returned to Belfast for restoration to civilian service. Her interior was modernized and her boilers were converted to burn oil rather than coal. Oil was more expensive than coal, but it reduced the refueling time from days to hours, and allowed the engine room personnel to be reduced from 350 to 60 people. During the conversion work and dry-docking, a dent with a crack at the centre was discovered below her waterline which was later concluded to have been caused by a torpedo that had failed to detonate. Olympic emerged from her refit with an increased tonnage of 46,439, allowing her to retain her claim to the title of largest British built liner afloat, although the Cunard Line's Aquitania was slightly longer. In 1920 she returned to passenger service, on one voyage that year carrying 2,403 passengers. She was joined by two former German liners Majestic and Homeric for an express service from 1922, operating successfully until the Great Depression reduced demand after 1930. At the turn of 1927-28, Olympic was converted to carry tourist third cabin passengers as well as first, second and third class. Tourist third cabin was an attempt to attract travelers who desired comfort without the accompanying high ticket price. New public rooms were constructed for this class, although tourist third cabin and second class would merge to become 'tourist' by late 1931. One year later, Olympic's first class cabins were again improved by adding more bathrooms, a dance floor was fitted in the enlarged first class dining saloon, and a number of new suites with private facilities were installed forward on B-deck. More improvements would follow in a later refit, but 1929 saw Olympic's best average passenger lists since 1925. One of the attractions of the Olympic was the fact that it was nearly identical to the Titanic, and many passengers sailed on the Olympic as a way of vicariously experiencing the voyage of the Olympic's ill-fated sister ship. At the end of 1932, with passenger traffic in decline, Olympic went for an overhaul and refit that took four months. She returned to service in March 1933 described by her owners as "looking like new." Her engines were performing at their best and she repeatedly recorded speeds in excess of 23 knots, despite averaging less than that in regular transatlantic service. Passenger capacities were given as 618 first class, 447 tourist class and only 382 third class after the decline of the immigrant trade. 1933 was Olympic's worst year of business - carrying under 10,000 passengers in total. In 1934, Olympic again struck a ship. The approaches to New York were marked by lightships and Olympic, like other liners, had been known to pass close by these vessels. On 15 May 1934, Olympic, inbound in heavy fog, was homing in on the radio beacon of Nantucket Lightship LV-117. Now under the command of Captain John Binks the ship failed to turn in time and sliced through the smaller vessel, which broke apart and sank. Four of the lightship's crew went down with the vessel and seven were rescued, of whom three died of their injuries - thus there were seven fatalities out of a crew of eleven. In 1934, the White Star Line merged with the Cunard Line at the instigation of the British government. This merger allowed funds to be granted for the completion of the future RMS Queen Mary. Cunard White Star then started retiring its surplus tonnage, which included the majority of the old White Star liners. Olympic was withdrawn from service in 1935 and sold to Sir John Jarvis for £100,000 to be partially demolished at Jarrow, providing work for the region. In 1937, Olympic was towed to Inverkeithing to T.W. Ward's yard for final demolition. Olympic's fittings were auctioned off immediately before she was scrapped; some of her fittings, namely those of the First Class Lounge and part of the Aft Grand Staircase, can be found in the White Swan Hotel in Alnwick, Northumberland, England. Some fittings and paneling also ended up at a Haltwhistle paint factory. The rest of her fittings found homes in scattered places throughout Great Britain. In 2000, Celebrity Cruises purchased some of Olympic's original wooden panels and created the RMS Olympic Restaurant on board their newest cruise ship, Millennium (Celebrity Millennium, today). According to Celebrity Cruise Line, this wood paneling once lined Olympic's à la carte restaurant. In 2004, in the Titanic Museum in Branson, Misssouri, USA, a first class cabin from the Olympic served as an example of the class's interior quarters. The clock depicting 'Honour and Glory Crowning Time' from Olympic's grand staircase is on display at the Southampton Maritime Museum.